This is gonna be an interesting entry to write. You got to remember I am a UK based fan of a British show, but the majority of my readers reside in the US. Nonetheless, I write with a UK perspective and UK terminology (they are TROUSERS, not pants; it ’s a COAT, not a jacket!). So what follows is a British view of how the US handles my precious series. 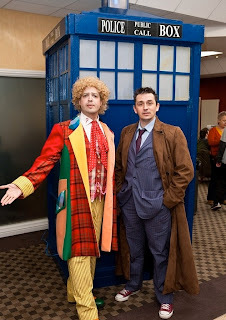 I am not actually a big convention goer, a least not to the format of events such as Gallifrey. Back in the 1990s I used to run and organise conventions for The Prisoner appreciation society, with Portmeirion (the principle location for the series) as our venue. There was nothing like it. We would watch episodes in the village town hall, and if you glanced out of the window you could see the buildings you were seeing on the screen. We would all dress up in the colourful costumes from the programme and parade around the village recreating key sequence. The clothes were fairly easy to replicate, and no-one went in for excessive detail – it was the overall look they were going for, and the mass effect was than the eye needed. It was awesome, and having been spoilt like this for over a decade, I never really took to the hotel-based events, since they could never compare to a live Portmeiricon event. So when I started to get into the new Doctor Who I found a thriving community of cosplayers, all showing off their costumes and swapping tips and discoveries they had made. It didn’t occur to me that most of them were in the US. The internet makes the world seem so small! The first event I went to was a pub screening and after party for Journey’s End. I had not long finished my latest coat a the time (the Mk III), so was keen to show it off with my newly bought Magnoli suit. We arrived a little late just as fifty t-shirted people turned to look at us. I tell you, it was an OK Corral moment! NONE of them were in costume, except for me. It was mid June and hot, and crushed together in a room with fifty other sweaty bodies made for a less than comfortable evening! I naively thought all the dressing up happened at UK conventions too. Oh dear – emphasis on the naively. 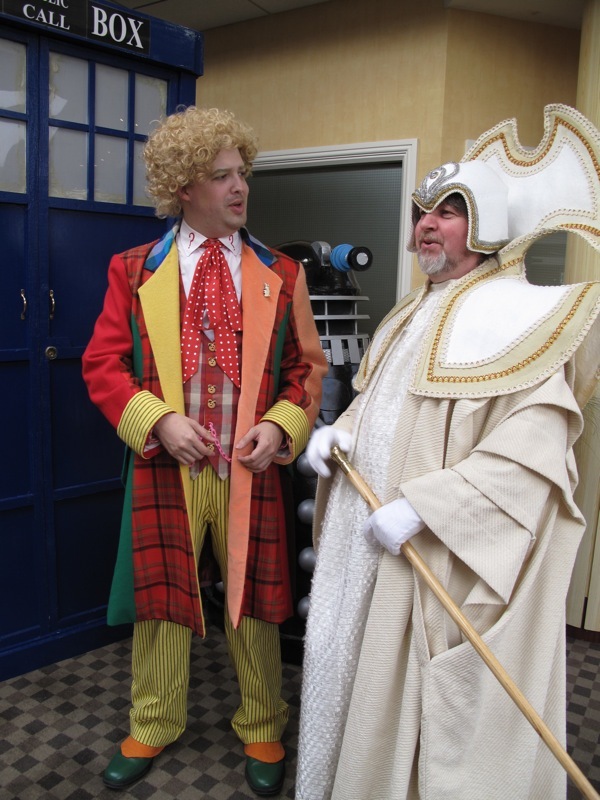 Anyway, fast forward to Time Quest in March 2010, and Bob Mitsch came over, with appropriate costumes for every doctor attending the weekend. I took his lead and went as Ten. There was a core dozen or so other cosplayers, but again the vast majority were in casual t-shirts and jeans. At least this time around I had a few friends to mingle with and not feel too out of place. I was starting to get the message that cosplay was not as big as I thought it was in the UK! So coming bang up to date, I could see some stark differences between UK and US events, the main one being cosplay! The Americans go mad for it! I felt that at least 50% of attendees in one form or another dressed up – and many of those had costume changes for the afternoon, evening, next day . . . .
At last I felt at home – but was 8,000 away! And I was made very much at home at that. I met a lot of friends I know through the forums, as well as many who knew me. To say I was warmly received is an understatement, and I left feeling part of a much bigger family than when I arrived. 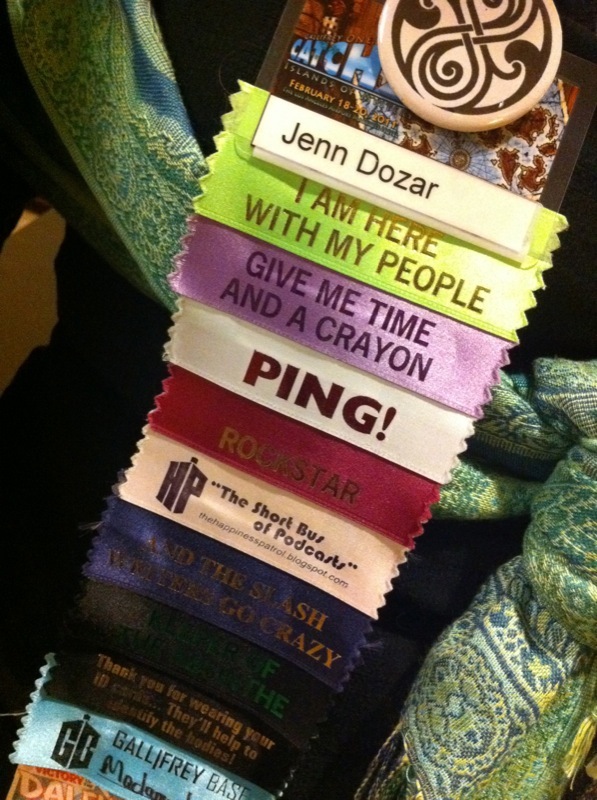 Another thing I discovered was the ribbons. If you’re in the US you will know; if you’re in the UK you’ll probably be in the dark as I was. I had been chatting to some friends, and a mutual friend of theirs had joined us. Before moving on to chat to someone else he pulled out a short length of wide ribbon and handed it to me. I didn’t quite know what to do. I didn’t have any cash to hand. He asked if I had one to exchange. No – I didn’t have a clue. The ribbon had a gold-foiled message. 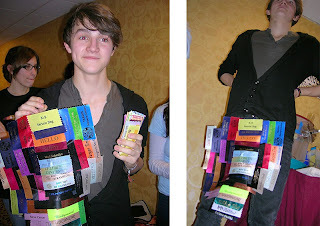 Apparently, you exchange these ribbons like calling cards and they have a peal-off sticky strip at the top allowing you to attach them to the underside of your identity pass. Additional ribbons are added below the previous, making a long trailing strip. They had all be bought from here, MarcoPromitionalProducts. As the weekend progressed I saw people walking around with twenty or thirty such ribbons attached, others with just a few. From what I gather the ball had really gotten rolling on this at a previous convention when Tommy Knight attended (see left) and collected enough of these ribbons to make himself what has been described as a kilt, which he wore! Following his lead everyone got into it big time, and this year it’s bigger than ever! 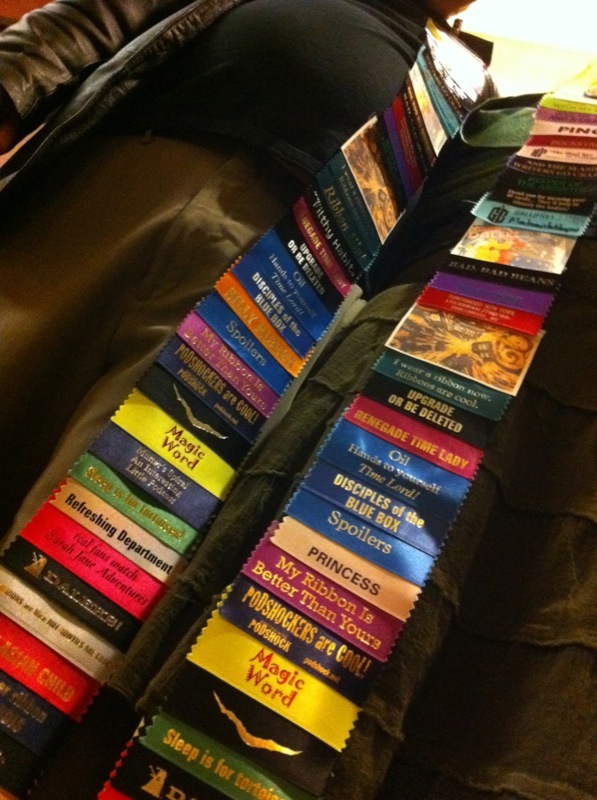 And it’s possible to collect a LOT or ribbons, cos this convention was well attended. Where in the UK you may get 200, 300, maybe 400 people at a good event, there was in excess of 2,000 people here. Now, I know America is a bigger place – goes without saying – but it is after all a little olde series from the UK which doesn’t really draw audiences comparable with Desperate Housewives or Mad Men in the US (the broadcast of A Christmas Carol drew 727,000 viewers on BBC America compared with 10.3 million in the UK). When it comes to conventions, they don’t do things by halves in America! what suit are you wearing? "When it comes to conventions, they don’t do things by halves in America!" I was dressed as Attack of the Cybermen Peri and I remember confusing you by handing you a hot pink ribbon, sorry! What is your opinion of the Magnoli Suit? I've been contemplating one. Not just americans, canadians too. If you ever go to an anime convention in Us or Canada, more then half the attendees are in costume. 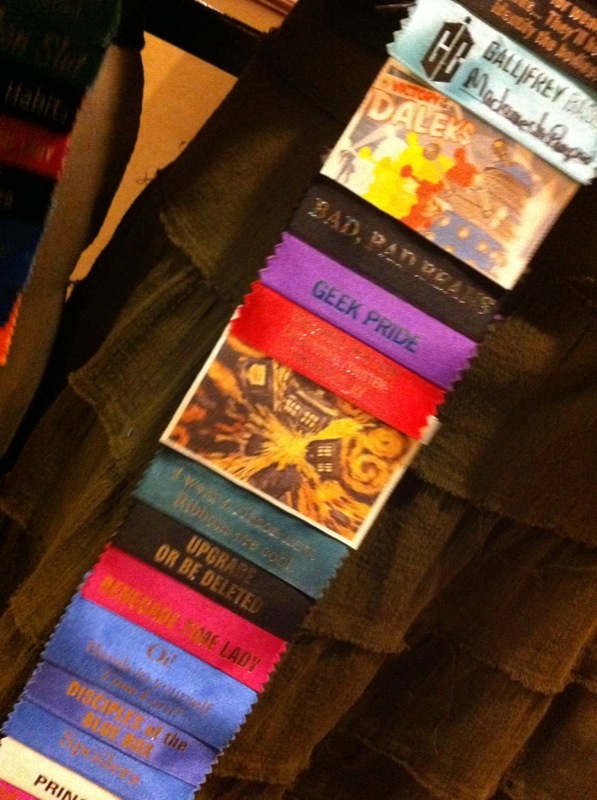 As for ribbons, it is mostly a scifi*fantasy convention thing. BUt oh! so much fun to do. i am not a panel girl very much, i like to walk and tlak to lots of people, so ribbon hunting is a very good way to break the ice. Hopefully, our paths will cross again in the futur.